Chemtrail Advertisements Coming to a Sky Near You? 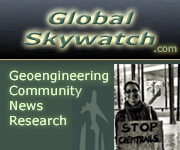 What do the geoengineers plan to do next? Arguably the largest undertaking in the history of modern humanity is the quest to control the weather of the planet by 2025. How do the geoengineers plan to sway the public into accepting skies full of artificial clouds? Hmmm, how could profits be made? How else can humans be plugged into the corporate military industrial complex matrix? Float ads in the sky! On an October day in 2013 while attending classes in San Jose, California we did a double-take as we looked up and saw spray from an airplane become an advertisement!?! This floating chemtrail ad hovered in the same spot for a long time – long enough for us to go out to lunch and return and still see it floating a few hundred feet above us. There are some dots to connect. About a week later we saw a Cessna dragging an advertisement for the company in the chemtrail ad you see above – something we are accustomed to seeing – banners behind planes. It is also of note that while catching a glimpse of the Rose Bowl Parade in 2014, an image with this exact same artificial cloud advertisement could be seen in the background for a split second – just long enough to imprint the subconscious mind. Continue to sweat out the toxins, decalcify our pineal glands and illuminate our selves to the truth.